W. W. Norton & Company, 2016. 260 pages. 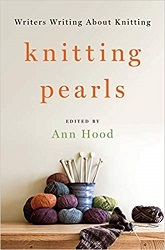 This is a book of essays about knitting, and the essays are written by twenty-seven distinguished writers. 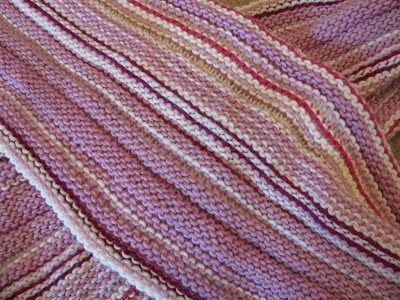 Not all of the writers are knitters, but all of the writers do have something interesting to say about knitting. Maybe they had a relative who knitted for them. Maybe there’s a particular knitted object that starts their musings. I took a long time to read this book. But that’s the beauty of essays – you can read one at a time and come away smiling. Or just musing about life. 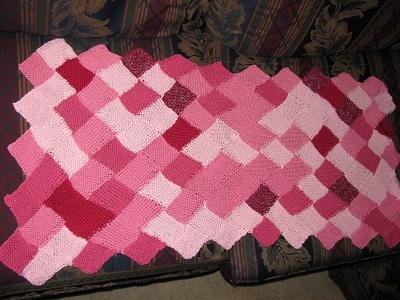 And speaking of swooning, here’s what you have to look forward to when you read Knitting Pearls. 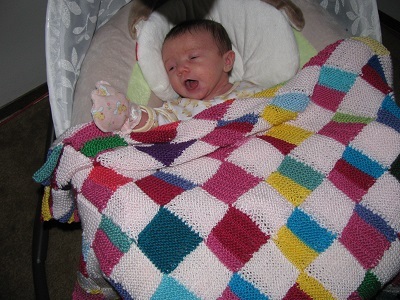 Like me, some of the contributors knit their way through adversity. Caroline Leavitt’s first husband asked her to make him a sweater with brontosauruses on it, but as she knit the marriage began to crumble. 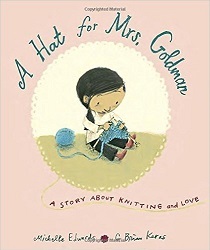 Lily King’s daughter knit a hat during their year living in Italy, which eased her homesickness. 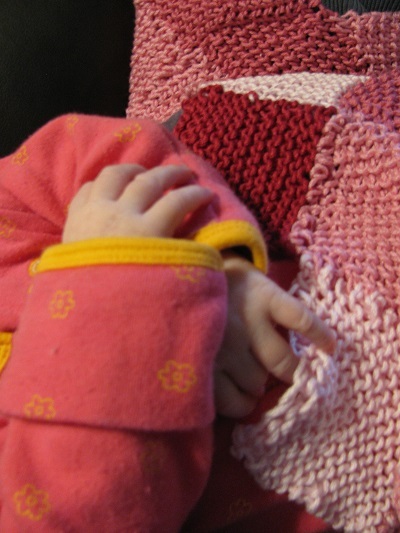 Cynthia Chinelly knits to help her escape the worry she has for her son. 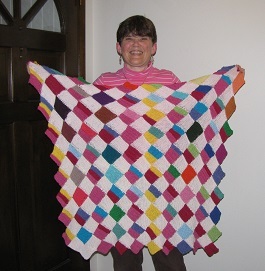 Melissa Coleman hoped that knitting a sweater for everyone in her family would remove the curse of divorce. 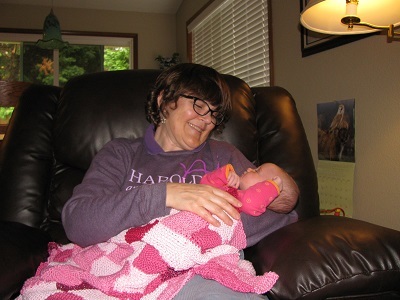 An on-again, off-again knitter, Robin Romm returned to it when her mother was dying, and now knits as she waits for a baby. 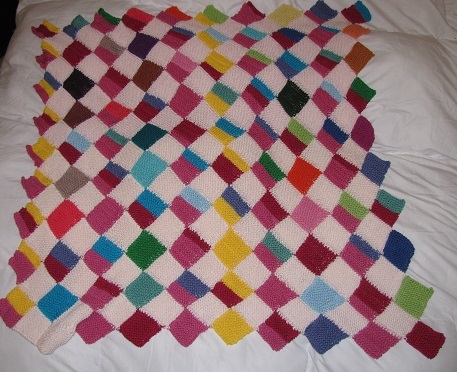 Back at Ithaca College in the 1970s, Bill Roorbach joined the knitting club to get over his broken heart – and to meet girls. 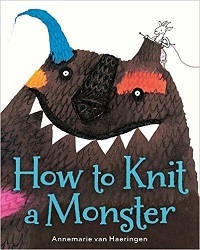 If you love knitting, you’re going to enjoy this book. 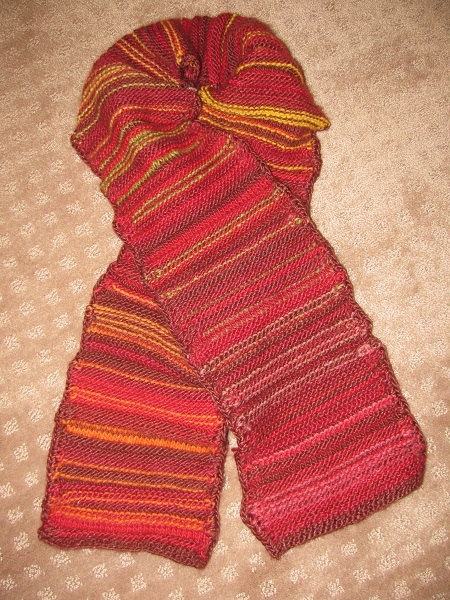 Today I finished a second Normal Distribution Scarf. The first one I made was designed to highlight outliers to show that outliers are what makes the world beautiful. For this one, I only wanted to show the Normal Distribution. 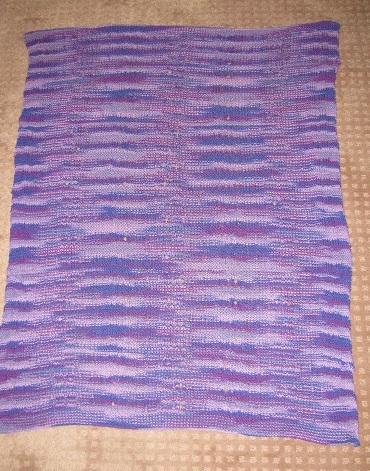 I decided to knit it the long way so this time I wouldn’t have to sew any ends in. I took colors from light to dark, in shades of pink. Colors B and C were a little closer than I wanted them to be, but it still gave the idea. I generated numbers from a normal distribution and made a big list. 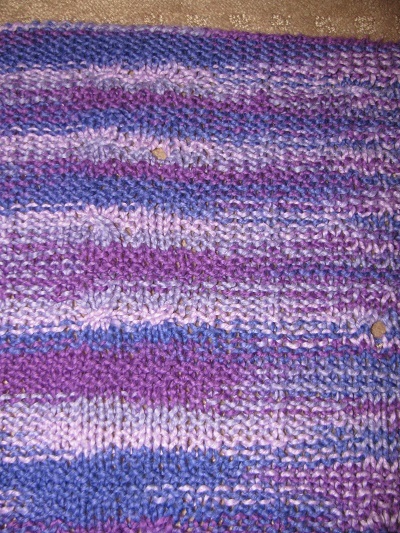 For positive values, I purled the row, and for negative values, I knitted — so those values should be about even, making random ridges. For the color, I used the absolute value, from light to dark. Since the normal distribution is a bell curve, there should be many more values in the lighter colors. For 0 to 0.5, I used White. 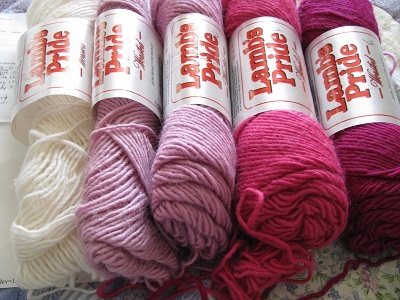 0.5 to 1.0 was Victorian Pink. 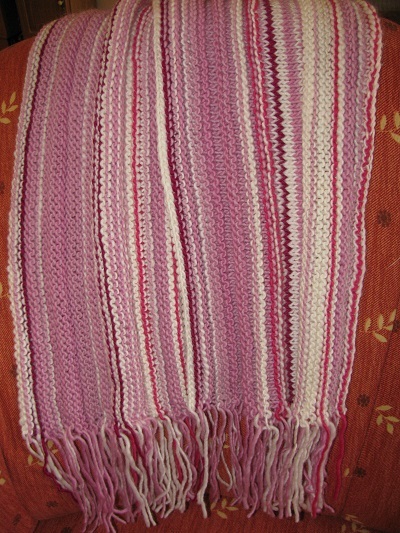 1.0 to 1.5 was Blooming Fuchsia (only a little darker than Victorian Pink). 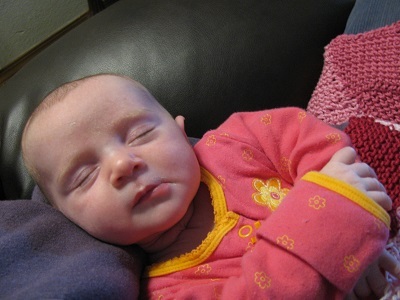 1.5 to 2.0 was Lotus Pink — a bright, hot pink. 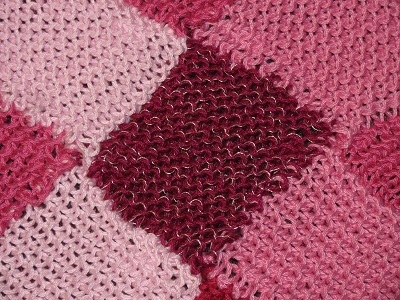 Above 2.0 was Fuchsia — a dark burgundy. Naturally, I used a lot more of the lighter colors. 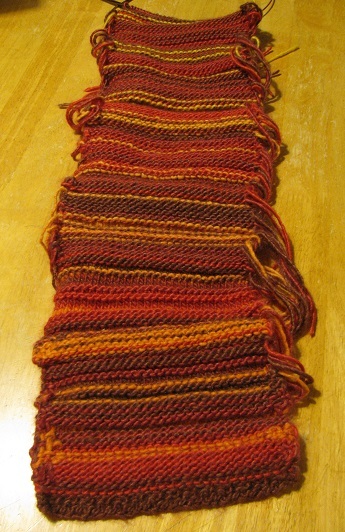 So for my next project after my current one, I think I’m going to do another normal distribution scarf, but this time reversing the values. 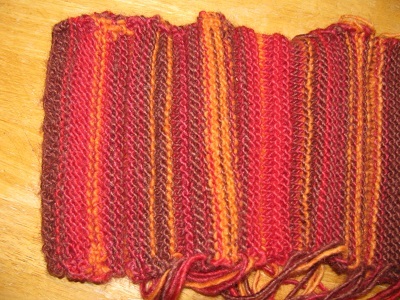 So the new scarf would be mainly dark colors with light highlights. In this version, the lighter colors were more prominent. 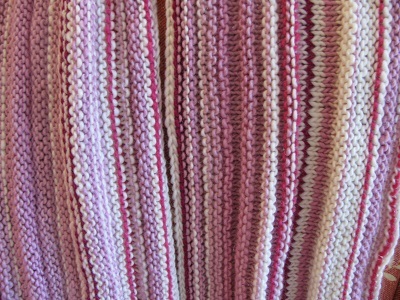 Here’s a view of the scarf draped over my couch, showing both sides. 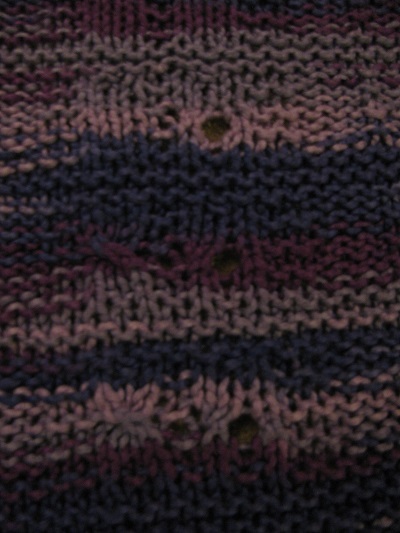 The different look has to do with where the knits and purls were placed and which side has a ridge and which is smooth. I like the way the color combinations turned out so pleasing. 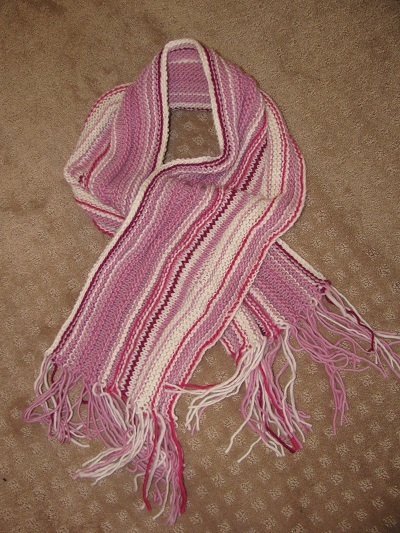 The only real problem is that the scarf is made out of wool, and it was almost 100 degrees outside today. So for now, I’m going to have to enjoy it draped over my couch rather than wearing it. I’ll look forward to this summer! 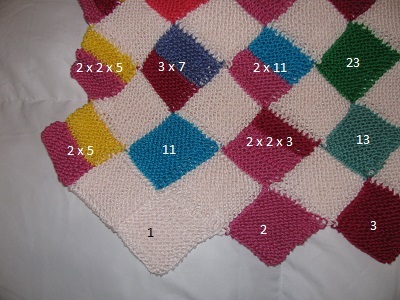 I recently posted an explanation of my Probability Scarf, where I simply rolled a die to decide which of 6 colors to use for each row of the scarf. But that represents a uniform distribution, where each color is equally likely — a little boring. 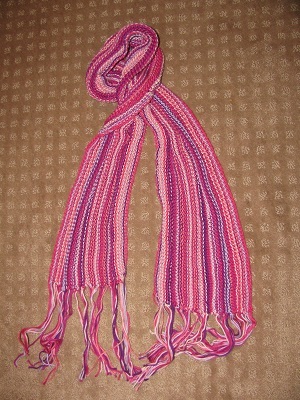 So I thought: Why not make a scarf using the normal distribution, a bell-shaped curve. I searched the web and found a site that would give me random numbers generated from a normal distribution. Brown is for the center of the distribution (numbers within half a standard deviation from the mean). This is where most of the data will fall. 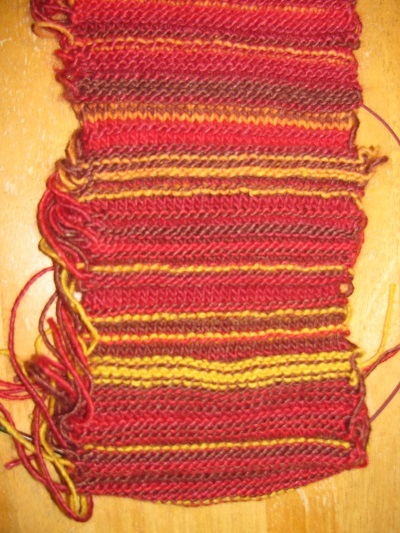 The next color has a bit more red in it, but it’s between red and brown. This will be for numbers between a half and one standard deviation from the mean. 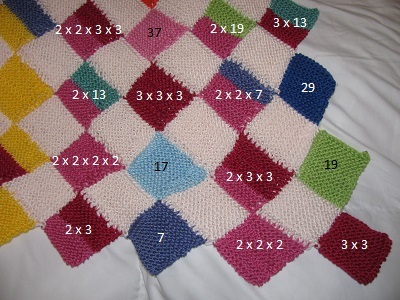 The third color will be used for numbers more than one standard deviation from the mean, but less than one and a half standard deviation. It’s quite bright and red and pretty. 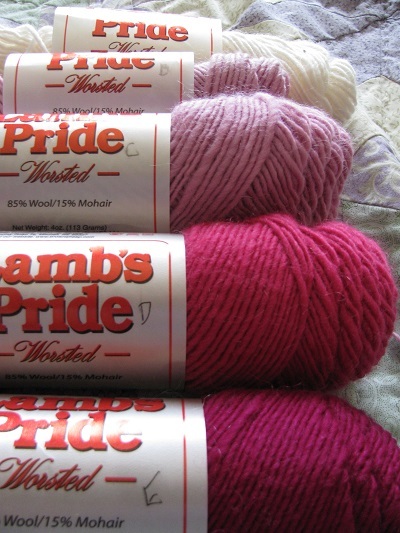 And finally — for the outliers — I bought a rainbow yarn. It turns out it changes colors very slowly, so you can’t necessarily tell that it’s rainbow-colored in the scarf, but it is bright and is slowly changing. Also, about half the numbers are negative and half positive. 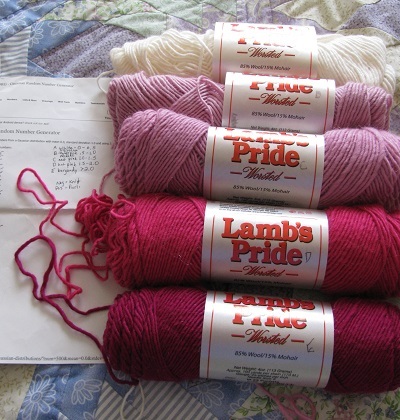 I went with positive is for purl and negative is for knit. 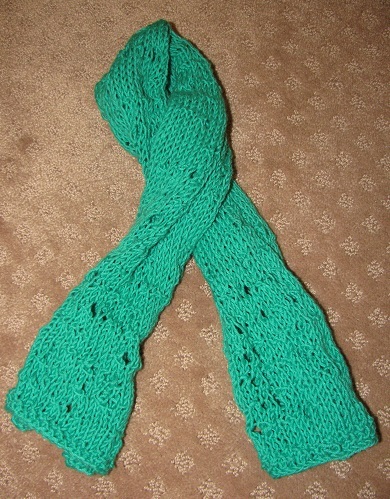 And the point of the scarf? It is the outliers that make it beautiful! Yes, we need the nice middle-of-the-road, close to the mean folks — but the colorful ones are the outliers and add spice to life. 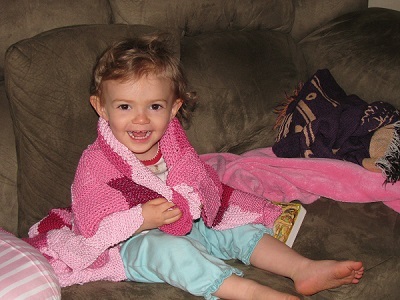 I’m planning to give the scarf to my daughter Jade, who has always been an outlier in several areas — and I fully believe that has a lot to do with why she is so wonderful. 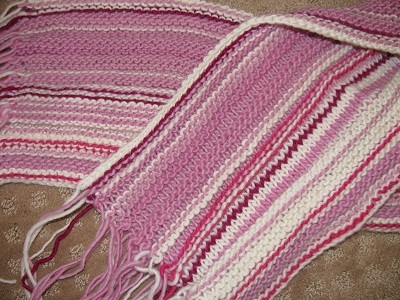 The scarf is turning out lovely. I plan to continue until I run out of one color. 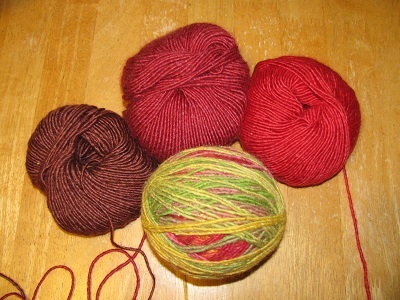 (I bought two skeins of the brown yarn.) 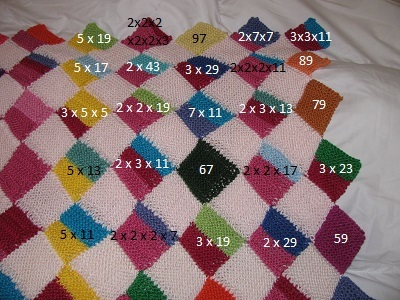 Yes, I am going to have lots of ends to sew in when I am done! 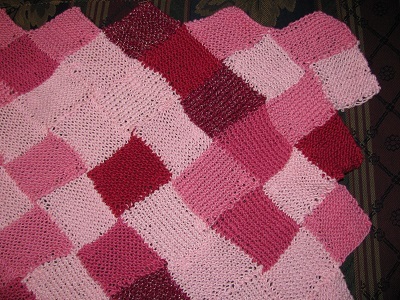 I’m planning to do a crocheted edging in brown to cover up some of that. 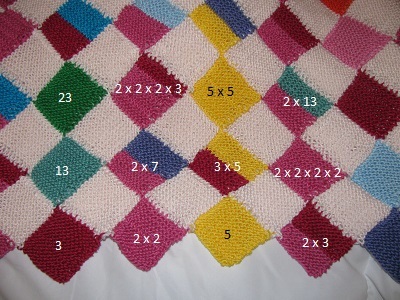 I’m gathering all my Mathematical Knitting links on my Sonderknitting page.